Also known as “skin prick nutrition”, mesolift treatment involves the injection of vitamins, minerals and amino acids directly into the mesoderm or middle layer of the skin. The addition of pure hyaluronic acid to the solution provides added benefits, replacing the natural volume that’s lost over time. Capable of absorbing 1000x its own weight in water, hyaluronic acid plumps the skin and creating a firmer feel. Mesolift can be used to compliment other treatments such as botox and dermal fillers, but is also a brilliant anti ageing treatment when used alone. Known as non surgical liposuction, mesotherapy involves the injection of vitamins and minerals into the problematic areas being targeted. These injections melt the fat beneath the skin and shrink the fat cells in the fascia layer. The medicine is injected into the fat or cellulite tissue, improving circulation and lymphatic and venous drainage by increasing the metabolism of the cells in the treated area. The fat is dissolved, and is excreted by the kidneys and bowels in exactly the same way as with natural loss. The combination of vitamins, minerals and amino acids is tailored to each individual client – many factors are taken in to account, including age, gender, area of treatment, and past medical history. 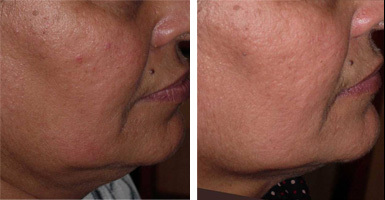 Mesotherapy is an effective treatment that leaves the area feeling firmer and more toned. * Cellulite is significantly smoothed, and inches can be lost. * The addition of Vitamin C improves the condition of the overlying skin. Cellulite common on the hips, buttocks and thighs, appears in the subcutaneous level of the skin. Fat cells are arranged in chambers surrounded by connective tissue. As water is retained or weight gained, this connective tissue is stretched and eventually leads to the lumpy “orange peel” appearance. Treatment courses are individual to a patient’s needs, and would be discussed during initial consultation. When the desired effect is achieved, an annual course of 4-6 treatments can be used for maintenance . Some lifestyle changes would be necessary to maintain the effects, and one of the “top up” treatments can also be used.